Galettes, free-form tarts originating in France, are simple to prepare, fun to shape, and a great way to showcase seasonal ingredients. Last summer, I made a peppery crust and filled it with peaches and blue cheese. 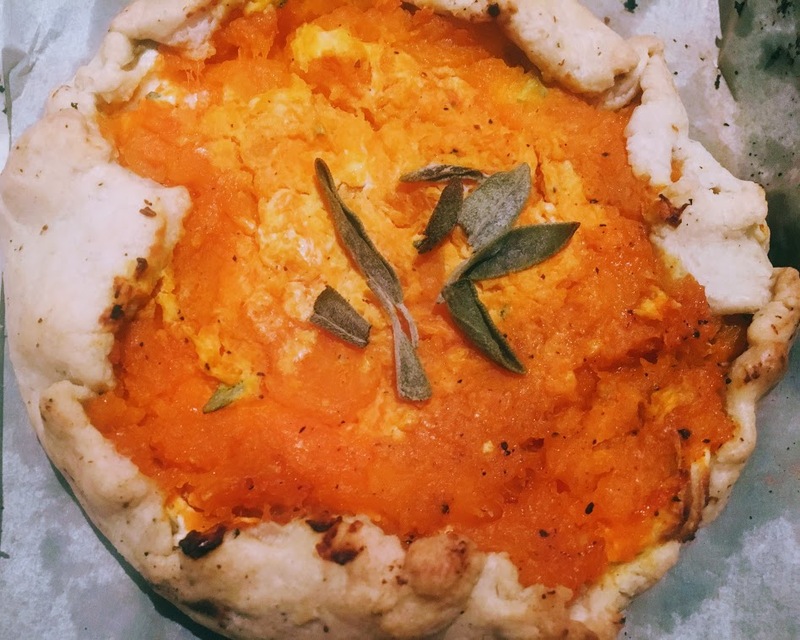 For the fall, I used the same black-pepper-infused crust recipe and created a butternut squash and goat cheese filling. Flavored with honey and sage, it’s the perfect combination of savory and sweet, and a great addition to a Thanksgiving menu. Preheat oven to 400 ºF and line a baking sheet with parchment paper. Remove prepared pie crust dough from fridge and set aside. In a medium-sized bowl, mix together goat cheese and honey until smooth and fluffy. Stir in sage, salt, and pepper. Divide dough in half, and roll each portion into a circle around 1/8 inch thick. Transfer to prepared baking sheet. Divide goat cheese mixture in half and spread each half onto a round of dough, leaving a 1 to 2 inch border as if making pizza. Spread around 1/2 cup butternut squash filling over the goat cheese. Gently fold the edges of the dough over the filling. Garnish the center of each galette with a few sage leaves. Bake for 25-30 minutes, until the filling is set and the crust just begins to turn golden brown. Let cool for a few minutes before serving.